Oh and this article isn't complete. I'll try different recipes and share my findings! The photos above show you the first cake that I've ever baked! I wasn't really interested before, but this has changed recently. And what a recipe to start with! It was a delight to make, because it was easy, it didn't involve many ingredients, the items that were needed are available in most supermarkets and the longest part was when it was being cooked, as opposed to, the preparation. These are factors that matter to me, but even more so, it was moist and delicious! This was another new venture. I hadn't made fudge before, but since finding this recipe, I've made it a few times! This raw fudge is really quick to make, creating a fudge that melts in your mouth! It's so delicious! This is my second attempt at making a chocolate chip cupcake. I was disheartened after my first try because although they looked amazing they tasted really doughy and they weren't very moist. I used a different recipe to make the cupcakes shown above time and I felt super chuffed! These cupcakes were delicious, moist, sweet but not too sweet, they didn't take long to make, and all the ingredients were easy to find. These cookies were the quick and easy to make and I didn't get bored of eating them either! They were crunchy, savoury, yet sweet and simply morish! To make these cookies, you need a little time and patience but the result is delicious! I'd recommend making them at least once! Maybe you and a friend could make them together. Catch up, make these delicious treats and then have a sitdown and enjoy them with a cuppa. This recipe uses ingredients that are easy to source, which is always a bonus! The cookies were easy to make and I ended up with a batch of soft, tasty, moorish cookies. Suraj and I were going to have dessert and coffee with some friends. The thing is...they're not vegan, and we were meeting them socially, for the first time. For this reason, I didn't want them to stress about finding a vegan dessert recipe and feel any type of anxiety about it, so I offered to bring something with me. I also wanted to try out this recipe and hopefully impress with them with how delicious vegan cakes can be. The recipe was easy to follow, it uses ingredients which are easily available and the result was delicious! We took some of the leftover cake for family that we visited the next day. So apart from Suraj and I, four people tried this Raspberry Chocolate Cake and the comments were positive. We went to see a couple who had twins about eleven months ago. They try not to give them sugary things, but the parents like desserts, and I like trying new recipes, so this was the perfect opportunity to make this Peanut Butter Mousse Pie. It was an easy recipe to follow, took less than 20 minutes to make, and it tasted delicious, especially when it had been chilled. I used a 250g packet of pitted dates. This recipe was super easy to follow. I made it a few weeks ago but amended it a bit more this time. I melted some dark chocolate and mixed it with maple syrup and vegan single cream. I spread a thin layer of it on the base. I spread the peanut butter mousse on top of that and then added more of the chocolate as a final layer. We've invited my cousins over for drinks and dessert on the weekend. This is one of the treats I've made for us. 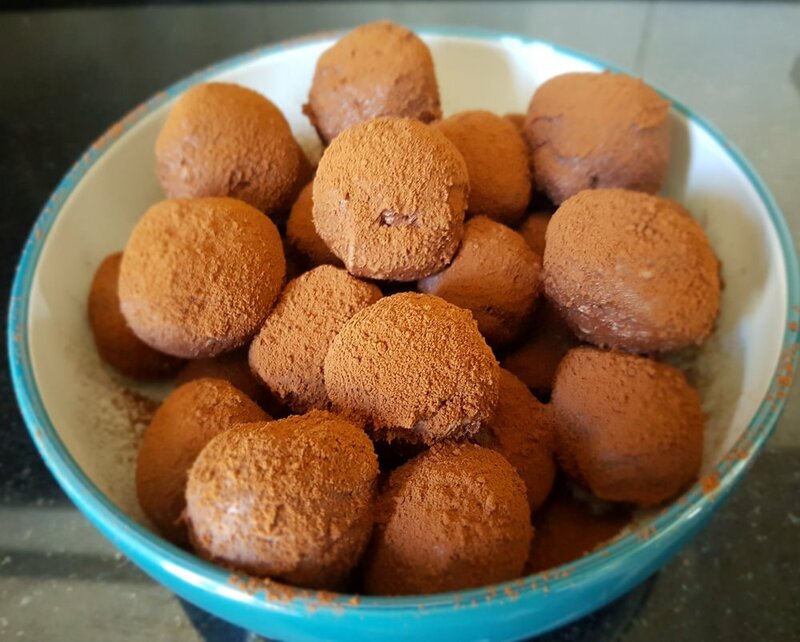 Chai-Infused Chocolate Truffles! The recipe was easy to follow, the steps weren't complicated, the ingredients are pretty easy to find, it didn't take long to make, and most of all, they taste delicious! I made two desserts for a recent family get-together and when pushed to choose a favourite, they chose this one. Did you like this collection of recipes? If you would like more of the same, click here to receive Plant Shift's monthly newsletter.